Here’s our list of Frequently Asked Questions (FAQ). Click on + sign for answers. See the Section BOOK THE CHOIR on the website Homepage. It contains an online ENQUIRY FORM which should be fully completed with details of your event. Our Choir Secretary will respond to you within a couple of days. How much does it cost to Book the Choir? Does the Booking cost include travelling expenses? Travelling expenses may be additionally incurred if the distance to your event is outside our catchment area. You will be notified accordingly. Can I book a smaller number of the choir to attend an event? Unfortunately not. We only take bookings for the choir as a whole to attend any event. How do I book tickets for Choir Concerts? Tickets are available from choir members or from designated outlets named on Concert Blogs and posters. Do you organise Charity Concerts? If you are a Charity you’ll have to do this yourself, but we will give you support. You have to arrange a suitable venue, ideally with a tuned piano. Do I need to have sung in a choir before? Will I have to audition to join the choir? Our music director, Arwyn Roberts, will listen to you singing informally, but only to place you in the appropriate section of the choir. Tuesdays 7:30pm to 9:30pm at Eirianfa Community Centre, Denbigh, if no concert engagement. There is usually a two week break for Summer and also at Christmas. How much does it cost to join the choir? The annual membership fee is £30.00 which includes entry into the Monthly Choir Tote Draw. Uniform (with the exception of shoes and socks) and song sheets are provided free of charge. Does the choir compete in competitions? We do not consider ourselves a competitive choir. 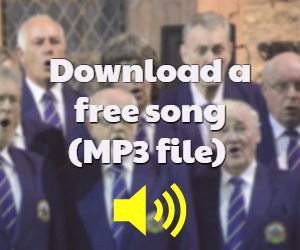 We are a community choir and enjoy performing for charitable organisations and other concerts. It is always pleasing to have a good ‘turnout’ but there are always reasons why attendances are varied. If you have a question that isn’t covered above, please use our Contact page to get in touch.